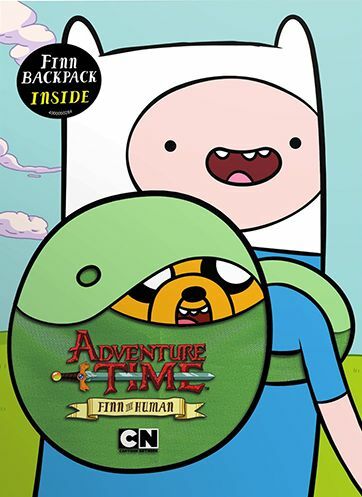 A new Adventure Time compilation DVD is here called Finn the Human, and while previous compilations included a Finn hat and a Jake hat this one includes a Finn backpack. When I say that, I don't mean a backpack with Jake on it but rather the backpack that Jake wears in the show, that green rounded one. It's a cool pack-in, definitely one I'd use more than either of the hats, and it seems to be of pretty good quality. This compilation contains a mix of episodes from seasons one through six with the exception of having no episodes from season two. Most of the episodes are from season five, with two from season three, three from season four, and two from season six. So it's not a very diverse mix, but kind of understandable since the complete seasons one through four have already been released. Basically the only reason to get this is to get the backpack and/or if you just can't wait to have some of the season five and six episodes on DVD. The show takes some getting used but I'd recommend checking it out. One you get past the weirdness it becomes quite enjoyable. One of my favorite episodes on this disc was where Finn gets a cursed sword made of a blade of grass. He apparently loses it at some point because he doesn't have it in the season six episodes. Another great one was Conquest of Cuteness, which was also on the season three box set. It's about these cute adorable little creatures who try very hard to prove they're tough, and our heroes decide to help them out by pretending to lose in battle. My little description can't really do it justice. All episodes included were good episodes, but it's still hard for me to recommend this DVD only because I'd instead recommend the full season box sets. Yet I would recommend the backpack pack-in because it's cool. But cool enough to pay full price for this set? Probably not.